A new experience: For the first time ever, I carried a sign and participated in a march. It was liberating, necessary and — now that I know what marching feels like, it will certainly happen again. Why now? Guns. I’m heart-broken and furious about the killing going on in this country. Every day brings new headlines about the murder of our little children and adult children. I had to do something. So this morning (Saturday, May 9th), I hung out with Moms Demand Action for Gun Sense in America. 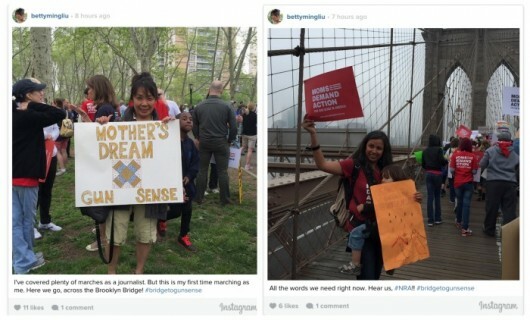 It was the moms’ 3rd annual march across the Brooklyn Bridge. We started out at 10 a.m. It took about half an hour to make the one-mile walk to a rally at City Hall. Growing up in Chinatown, I used to love walking across this beautiful bridge. I hadn’t done it in decades. What a memorable way to update my references by walking it again today as part of a new community. We were a marvelously racially diverse crowd of women, men, kids and babies. While the crowd was heavy on New Yorkers, I spotted a woman from Tennessee and chatted with a woman from Rhode Island. There was also a sizable contingent from Newtown, Conn., scene of 2012’s deadly Sandy Hook Elementary School shooting that murdered 20 children and six staffers. Someone handed me a sign and I took it. The shape on it is a quilting square. It refers to the Moms Demand Action quilting campaign to make squares commemorating every child who has been killed by gun violence. Read more about this project here. I am impressed by this campaign, which you can read about here. It takes money to come up with something like this, which is important to mention. 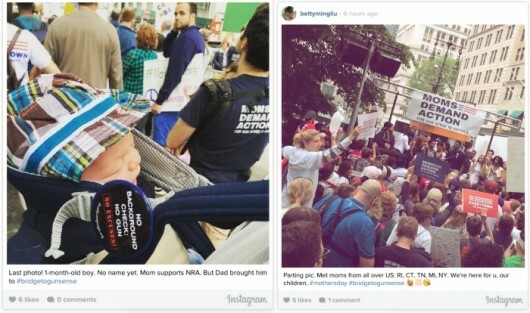 FYI: The moms have financial backing from former NYC Mayor Mike Bloomberg, who is spending millions on trying to build grass-roots support for changing America’s gun laws. Fighting for stricter gun safety laws is a very tough battle because the National Rifle Association is so powerful. But keeping the issue on everyone’s radar is a place to start. That’s why I decided to march. One of the organizers told me that about 300 attended last year’s Brooklyn Bridge walk. She said that this year, 700 rsvp’d and 500 were counted. Definitely progress. With marchers tweeting like mad, I did my part via social media too. Most of my photos are on my Instagram account (@bettymingliu). I also got a kick out of spotting Donna Karan, who took a bunch of photos with her smart phone. Since she’s always been one of my favorite fashion designers, I was touched that she gave each of us a black leather wraparound bracelet embossed with the words “NOT ONE MORE.” She usually sells them for $30 via her Urban Zen foundation, with half the proceeds going towards Bloomberg’s effort. Not one more. We can’t afford to lose another child to gun violence. Not one more. The march made this a very special Mother’s Day weekend for me. If you’d like to know more about Moms Demand Action, check out momsdemandaction.org. And, have a wonderful, wonderful Mother’s Day. Hold the children close. xo. Proud of you Betty. It’s so great that you marched and expanded on the gun control issue on your blog. GOOD FOR YOU BETTY!!!! As you know, I teach at the inner city campus of Merer College here in Trenton. We lose an average of one student a year to random gun violence. Last year it was a student I knew – a bright, handsome young man who was in the learning center every night until 9, working hard to make something of himself. One night he was just standing on his girlfriend’s front porch when he was killed in a drive-by. The whole college was just broken hearted. There was absolutely no way to make sense of it. And every year there is another one or two. How many times do we have to cry? Toby, how did you all get through the semester? And why didn’t we hear more about young people like this student of yours? I blame the media, I really do, for churning out stereotypes about kids of color and inner-city youth. Thank you for sharing about him. Come back any time and share more about your students. Break our hearts. We need to feel what the parents of these dead kids are feeling. Thanks, Ivan! We’re in the throes of major social, political and economic shifts. i want to be part of the discussion — and the solutions. I applaud you, Betty! The NRA grip on the gun laws is despicable. I’ll March with you next year! What a wonderful way to celebrate Mother’s Day by walking for mothers and children, and anyone affected by gun violence. I walked on the Brooklyn Bridge for my last birthday and for the first time ever (even though I am a Brooklyn native) on New Year’s Eve in 2013. History tells that countless lives died in order for that bridge to be possible. 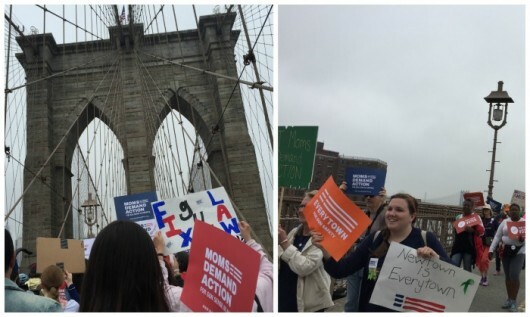 The Moms Demand Action walk across the bridge reminds us that we must make it possible that there are no more needless deaths from gun violence. Enough have died. One was too many. Thanks for sharing and spreading the message. Skye, thank you for your passionate Mother’s Day thoughts. I remember you mentioning your BB walk and was touched by it. Very emotional for you. The bridge has an amazing life as a platform for our causes. So many demonstrations and protests have gotten publicity from crossing one of the most beautiful bridges ever — the whole scene is highly mediagenic. On Saturday, just as we were getting off on the Manhattan side, we crossed paths with another group, the National Alliance for Mental Illness, which was getting on to march to Brooklyn. Cops were everywhere, making sure we all kept moving like clockwork. An amazing sight and experience.